Brook Hsu photographed in her Bronx studio. 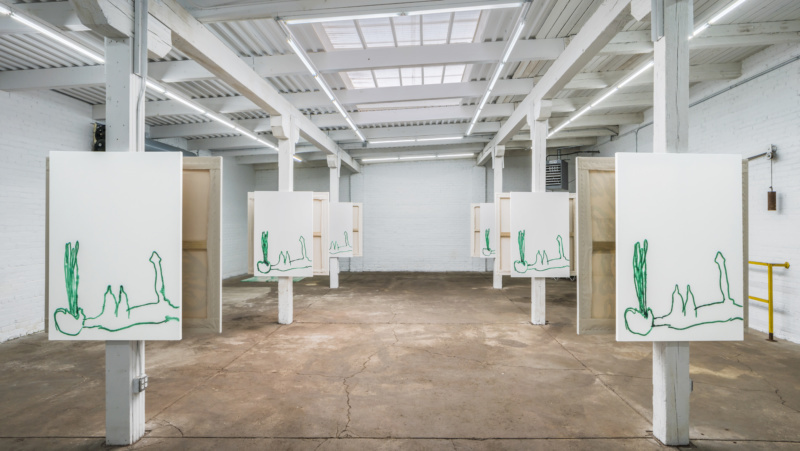 Installation view of Fruiting Body, 2018. Hsu’s ability to connect disparate themes in order to summon deeper thought may come from traversing vastly different cultural and topographical landscapes. She grew up in Stillwater, Oklahoma, and attended the Kansas City Art Institute and Yale University. There was a stint in Los Angeles before returning to New York. “Panic Angel,” her 2017 exhibition at Brooklyn’s Deli Gallery was a meditation on her mother’s battle with breast cancer and a breakthrough show. The partner text, “Take Away,” introduced the pain of cancer through the allegory of the Greek god Pan and referenced everything from Rimbaud to Roy Orbison.